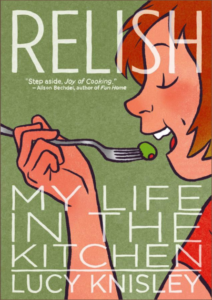 Graphic Novel Review 45/365: Relish – First Second Week! Caution: This book is only for those of you that love food. I mean really love food. If not, you can stop reading, and go back to your protein shake. 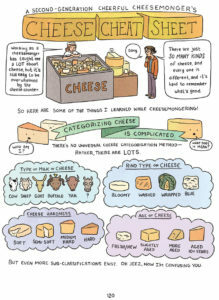 Lucy Knisley’s Relish is a work of graphic non-fiction that made me smile the entire time I was reading it. 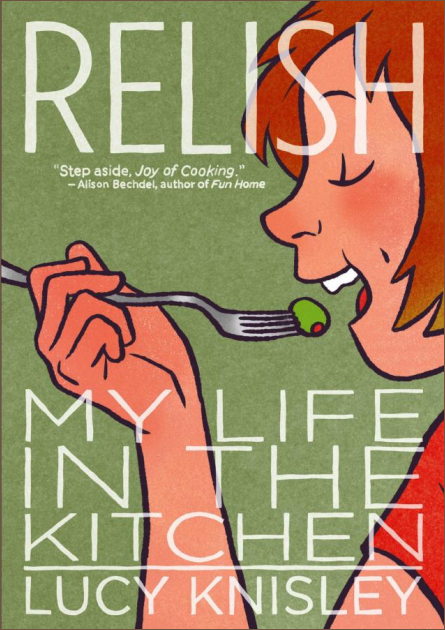 Focusing on her childhood and growing up around and in the foodie culture, Relish hits the target for those of us that obsess about eating and what it means to us. I grew up in a home with parents that didn’t know what spice was. Like many kids of the 70’s, 80’s, and 90’s, I had parents that were raised on unseasoned, overcooked meat and potatoes, and with little to no money in the house, it was hard to gain culinary experiences. As I grew older, made a little money of my own, and became adventurous with my food obsession, I was lucky to have discovered a love for food and cooking that many people may not find. I believe that this book is for us. But, man, I say that with reservation because I know there are millions of people in this country that will never get the chance to explore food the way it is explored in Relish. I feel bad about that. So, I’m a bit torn here. I love the book! It made me feel happy throughout, but I’m also sad at the thought of so many people in this country that were not given the opportunity to eat like I have, and I haven’t even eaten THAT well. I guess that’s why I’m always trying to bring different types of food into my classroom. I guess that’s why I’m trying to take the teams that I coach to different team-building meals and why I used to host Speech Team Grad BBQs at my house over the summer. Food brings us together, but I also understand that food can create a social divide. I know my review went a little off the track here, but it’s important. If a piece of media affects you, like this book has affected me, you should want to talk about it. I also relish (no pun intended…OK…a little) that Luck Knisley discusses eating on a budget and her obsession with junk-food like McDonald’s fries; it makes the book more human. I would never recommend this book to a friend like Mike Dozier, a friend of mine that would admittedly eat every meal in pill-form if he could. I would also not recommend this book to a friend that never cooks or discusses food with you. If you love food, and you read this book, then you know who this book is for…share that gift with them. And if you get the chance, help others explore and discover new food! Teachers, share your culinary experiences with your students, especially the ones that you know might not be lucky enough to have those experiences on the regular. Two years ago, I was lucky enough to give a senior his first Cannoli…a senior! This made us both happy. I was homeless for a short time as a kid, and I know a few times, my parents relied on food pantries to feed us. I also know that hard work has put me in a place to share things that I love and care about with others. And for me, those things are comics and food. I hope you can do the same with your success, even if it’s just a small success…share love. Thank you for inspiring this post, Lucy. I hope to chat with you someday about food and comics.